If you haven’t already read my previous post, you can find it here. My goal in writing these posts was to find a wide range of family friendly non-toxic products for the home and for children. 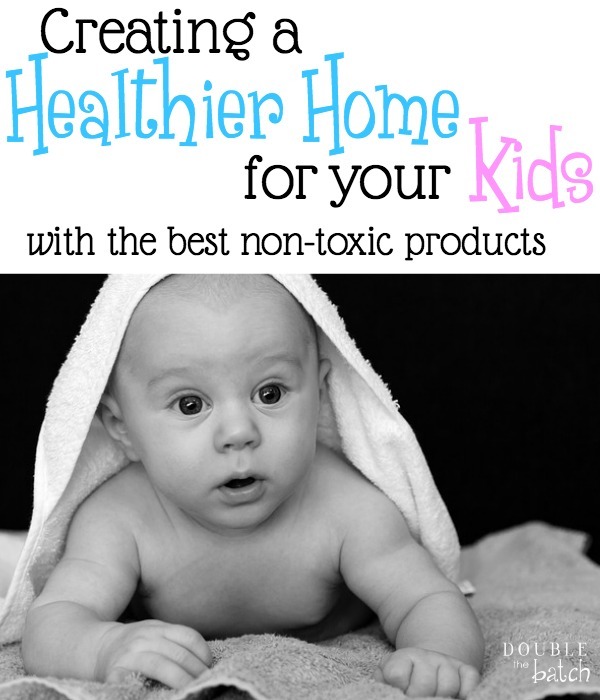 My kids are already exposed to enough toxins in the environment OUSIDE of the home, I figure the least I can do is try and eliminate them as much as possible INSIDE the home. I’ve used many products on my kids in the past 11 years, some were not good and I didn’t realize it till later on. Still other products that I THOUGHT were natural, sometimes ended up still being no good! So how the heck do you know what’s really the best to use? I started ignoring the flashy front of the bottle and started reading the back to find out what was truly IN the bottle. I also found a great website called EWG’s Skin Deep Cosmetics Database. You can search for almost any product that is made to come in contact with the skin. It scores the product depending on how toxic it is. The lower score, the better! I now try to only buy products that score a 2 or lower. The Skin Deep website will also list the ingredients and tell you more about them since most people (like me) don’t have a CLUE what any of these ingredients really are! Here are some of my favorite products (and companies) so far. They’ve been kid tested and mom approved (at least at MY house anyway! 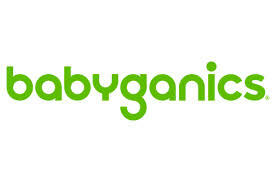 Babyganics has a complete line of products that are safe for babies (and kids.) Their whole goal is to make products to use on every part of your baby and also everything your baby comes into contact with. They have a complete line of skin care as well as cleaning products, wipes, and diapers. I was able to try out their foaming hand wash, face, hand and baby wipes, diapers, and their toy, table and high chair wipes. I enjoyed using all of their products and love that they are more natural and non toxic. The toy, table, and highchair wipes would be great to keep in the diaper bag for restaurants or other places your baby comes in contact with germs their body isn’t as familiar with. The wipes are a little bigger than normal baby wipes since they are meant for cleaning. The foaming hand wash was good and only had a VERY mild (almost undetectable) scent to it. Babyganics products can be found on amazon.com or visit www.babyganics.com to find a store near you. I had never heard of The Honest Company till recently when I attended my sister’s baby shower and someone gave her some of their baby skin care products as a gift. When I went to their website and created an account, they started emailing me all of their sales. When they sent me a code for 50% off my first 3 bundles, I caved and purchased their diapers and wipes bundle and their Essentials Bundle. At that price, I could definitely give them a try. Unfortunately, I really loved all of their products. I say unfortunately because their normal prices are are just a little too steep for me. You pretty much have to buy directly from them too so there’s not a whole lot of other places to look to get great deals (like amazon). Sooo….that being said, my verdict on this company is that they have excellent products but are hyped up a little and therefore the prices are a little too high compared to other competing companies that sale just as good of product for a better price. Too bad, because I REALLY love their diapers, wipes and haircare! If you want to give them a shot they have a free trial right now. You can find it here. Just don’t forget to cancel if you don’t want them sending you the full monthly bundle! My sister, Tina, who blogs over at Mothers.niche.com highly recommended TruKid to me so I thought I would give them a shot! They sent me a few products to try. 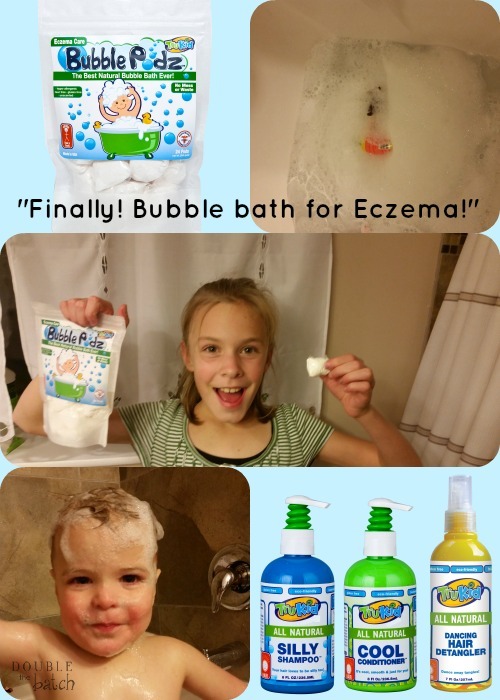 We have tried TruKid’s Super Cream, Eczema Super Cream, Bubble Podz, and their Hair Care Set bundle. I was excited to use the creams on my almost 2 year old because he has always had eczema on his legs, and it was especially bad now with the cold weather. 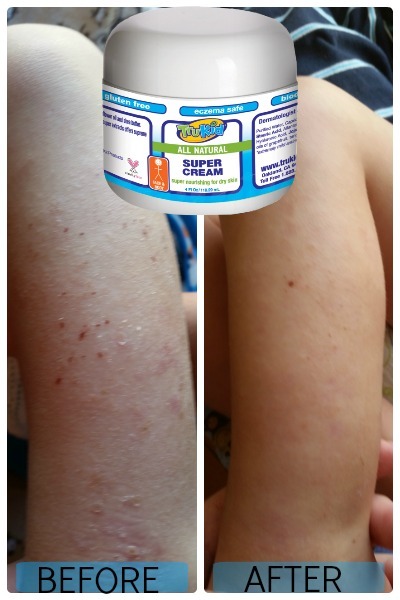 I actually haven’t tried the Eczema Super Cream yet because I’m currently using just the Super Cream and it’s working really well! The Eczema super cream is thicker, though, so I’m sure it would work even better for more sever cases of eczema. As you can see, after just 3 days of applying TruKid’s Super Cream, his legs went from dry, scaly, and scabbed over to being soft again. I put it on my changing table so I would remember to apply it 2-3 times a day. I’m so grateful this worked. 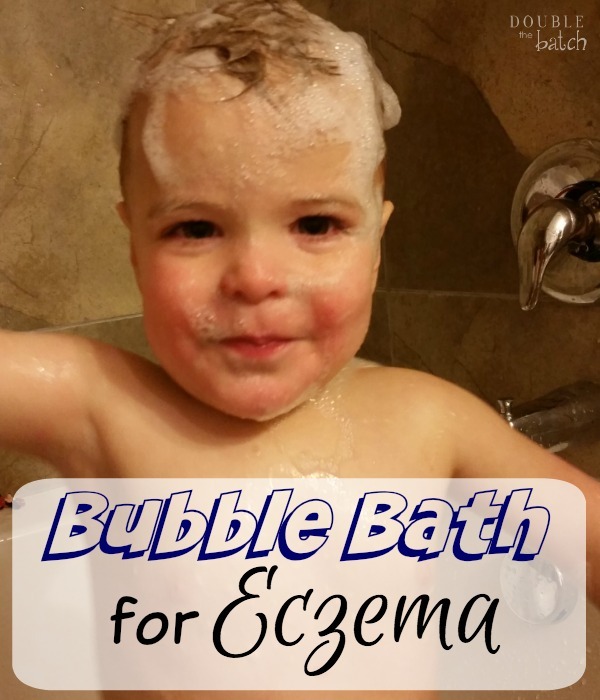 If you have kids with eczema, you know that soaps can irritate it and make it worse so I normally don’t even use a whole lot of soap on my kids in the bath. They were really excited to get to try these Bubble Podz and have fun with bubbles again. I really didn’t expect them create many bubbles but I was wrong! Yay! They didn’t seem to irritate any of my kids skin either. I really liked their hair care set also, especially the detangler for my 5 yr old with VERY thick hair. The only detangler I had ever used before, ended up scoring a whopping 6 on the Skin Deep Database so I just stopped using it a long time ago. Yay for something new that not only works well but is also better for my kids! I really wanted to review TruKid’s Sun Care line because my sister raved so much about how awesome it was last summer, but it’s the middle of the winter right now so it’s a no go but I know she absolutely loved their On-The-Go sticks! You can also visit their learn more about TruKid on Facebook, Twitter, and Pinterest. TruKid was kind enough to give me a coupon code for all of our readers. If you order $30 or more from their website at www.trukid.com and use the code trumom you will get 15% of your order. We are also having a giveaway this week sponsored by TruKid. Enter below to win some fun products!